The Varied Thrushes came back. Then the Western Bluebirds and Meadowlarks. My Dark-eyed Juncos are trilling in preparation to retreat to quieter breeding grounds, the Black-Capped Chickadees sing their two notes, and the Song Sparrows absolutely will not shut up. For all that, though, migration here is still largely a water-based show, with the most spectacular signs of springs coming in the forms of ducks, geese, and swans. As ponds thaw open reports are coming in of Barrow’s Goldeneye, Pied-billed Grebe, Cinnamon and Green-winged Teal, Gadwall and Wigeons and Shovelers. And yet, perhaps ironically, the biggest sign of spring in a Montana March is when the skies fill with white. 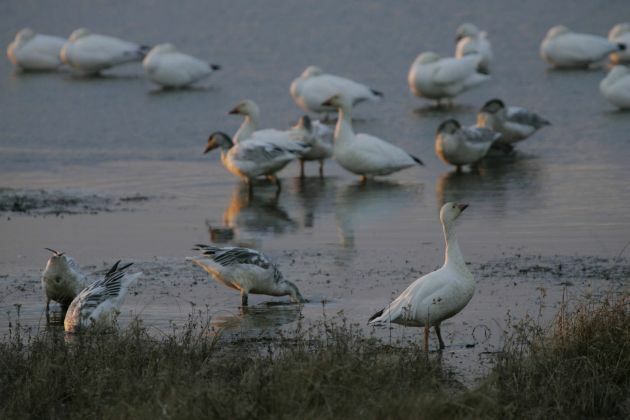 Several locations in the state, most notably Freezeout Lake, are graced with epic spring migrations of Snow Geese and Tundra Swans as they return north along the Pacific Flyway. 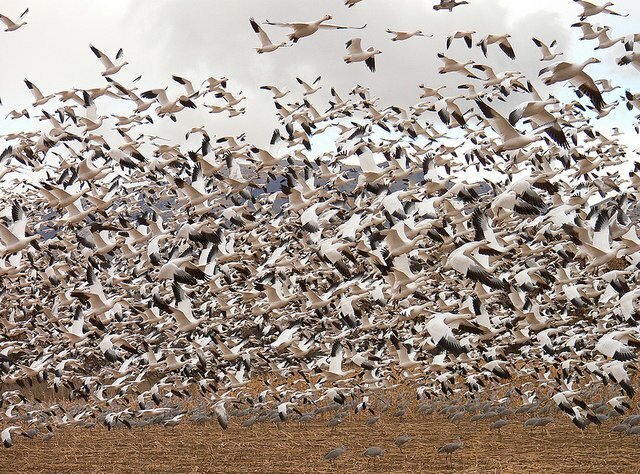 The Snow Geese in particular are popular with viewers all along the flyway, inspiring much comment even in bird-rich areas like Bosque del Apache (as shown below.) At Freezeout they may number 300,000 – in fact, the majority of the individual birds making their way up this flyway will stop at Freezeout on any given year. Rarities and other goodies — a Ross’s Goose, a first-of-season White Pelican — also turn up, but the main attraction at Freezeout is sheer numbers, and these numbers, this spectacle, draw a fair number of non-birders to the scene as well as the dedicated bird nerds. The rush of so many wings, the coordinated take-offs and landings, the sheer mass of life all bring to mind, however fleetingly, the great migrations we have lost. 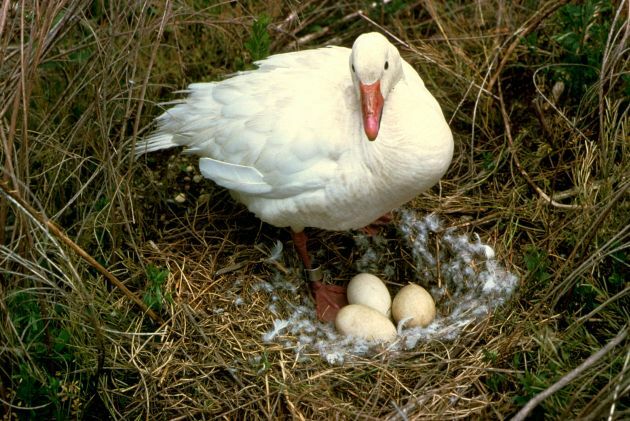 And on the surface it would seem that we are not in danger of losing this one, as the North American Snow Goose population is currently growing at a good clip, expanding into parts of the Arctic where they never before bred. Of course, in real life this cannot be so simple as good news. The population growth seems to be linked to increased winter survival — the result of increased agricultural food supply and wildlife refuges managed specifically to increase populations of ‘game’ birds to the exclusion of other goals — as well as milder Arctic breeding seasons. The result? Snow Geese overgrazing their breeding grounds, displacing other Arctic-breeding species and setting themselves up for a fall. This is one of the cases that illustrates the difficulty of so much wildlife management, from trying to decide what is ‘natural’ to figuring out what specifically to do about it. It’s natural that the geese will take their fill of the smorgasbord human activity has laid in front of them. It’s even natural, sometimes, for a species to change the landscape in ways that have detrimental effects on other species — we seem to be the only species that even bothers to be embarassed when we do it. At the same time, philosophically, only a handful of ecologists would throw up their hands and say we must let nature take its course here. Attempts to curb goose populations by increasing bag limits and lengthening hunting seasons have, unsurprisingly, failed. The ability to curb winter food sources is largely out of the hands of the people paying enough attention to make a difference. So in practice, nature may well take its course anyway, and this great migration too may go by the wayside — simply by virtue of being too great. Carrie Laben, after years of writing and birding in New York, moved to Montana to pursue her two great passions more effectively. She recently graduated with an MFA in Creative Nonfiction from the University of Montana in Missoula. When she is not cranking out essays and speculative fiction stories, or wandering around on mountains failing to see the birds she is looking for, she is likely to be drinking one of the many fine local microbrews or attending a potluck with something from the local farmer’s market in hand. On Mondays from 3 to 3:30 Mountain Time you can find her answering questions about birds on live chat at DaysAtDunrovin.com. Ha! You must be the only blogger who is capable of turning a post about a truly abundant and increasing species into a piece on extinction and decline! That’s why they call me the Pollyanna of birding! I recently wrote a post on several aspects of this issue including some distressing points on predator hunting, commercial trapping and the legal culling of non-game birds. What is a Blue Goose?